Don't forget, be safe tonight! Bundle up, be warm and have fun. We've already trained Mia to do a trick should someone ask! SAFE HALLOWEEN – 4:00-6:00 pm Kids under 12 trick-or-treat at Country Village shops. It gets CROWDED, I mean SUPER CROWDED! I've purchased 1,500 pieces of candy and when it's gone we will be out. Then I'm off to my house to take the girls out to load them up on sugar. Have a great Halloween! Da da da da…..we came in SECOND place for the boutique and 4th Place for the Salon. Woo Hoo! Let me say, considering we didn’t even get nominated until three weeks in for the boutique and like four days before the voting ended for the salon, we did amazing! Our customers are amazing. It’s a little disappinting we didn’t win, who doesn’t like to win. But we placed fair and square and came out with 67 comments (THANKS SO MUCH!) so who could ask for more. We are one tiny store, NOT located in a mall and we didn’t offer any discounts for votes. We placed second totally on our merits and I love that. We all work hard to bring great customer service and unique items to the area and I think it shows. Not a baby, a soldier. Somehow, while I was looking for something on the internet I came across a site called Soldier's Angels and decided to look around their site a little bit. Well, I thought this was the perfect opportunity to to teach Bella that the military isn't just Golden Knights, Blue Angels and Air Shows. That's really her only experience with the military and although super fun, a little unrealistic. My brother, her uncle Art, will get deployed to Germany in May and her half brother goes to Germany in a few weeks followed by a stint (over a year) in either Afghanistan or Iraq. I'm not sure if she understands what that means. So we officially have a new pen pal named Andrew. We are required to write him a letter once a week and send a little care package to him once a month. I am really excited to get this started. They say you shouldn't expect a response but I really hope we will be able to communicate back and forth. There is actually a number of soldiers that are waiting to be adopted, you can see it in the upper right corner of their website. Of course I wasn't just happy finding out his name and address so I did a little advance research to find out where he is deployed (as much as you can) and find out about where he is. Through OperationTroop Appreciation I found out that his particular unit is an active duty unit from Fort Carson, CO and supports the Iraqi Security Forces in Baghdad. I'm really looking forward to learning more about Andrew and hope to keep you updated here and there. There are very strict rules as to what you can say on any type of public forum, measures of course put in place to keep them safe. I'm also excited to do this with my daughter and have something we get to sit down and do together. Despite how anyone ever feels about war there are still young men and women that have a duty to serve our country, good or bad. I'm very honored and hopefully we will be able to help one of these guys have a little cheer from the United States sent their way once a week. Still no blog. I can't get motivated to write……. … to have been nominated for Best In Western Washington for both the Boutique and the Hair Salon. I don't know yet what the results are and probably won't for several weeks. But I'm thankful to have even been nominated. We are planning a day of being thankful in November. We will have cookies from Papa's Place (another Country Village nominee) and hopefully I will get Rob from Chapter's Photography to something (the other Country Village nominee). We will also have Sue Lundquist doing a book signing with her I'm Thankful Journal. A day of being thankful. Just before Thanksgiving. Perfect. I had a pretty rough week last week. What could go wrong, went wrong. I was so confused by it in fact, I went to check my horoscope, I haven't done that in a really long time. It was spot on. The start of the week may be quite challenging. A dent in your confidence may arise out of a slight miscalculation. Maybe you’ll read too much into a chance comment or development. While the repercussions will be fairly minor, you may decide to play it extra safe for the remainder of the week, which could, in turn, result in a missed opportunity on Thursday! Your motto: Nothing ventured; nothing gained! The desire for some breathing space could kick in on Monday, when communications go a little awry. Patience won’t be your strongest asset, but even though you’ll need to feel completely in control or in charge, you would do well to include and involve others. By Saturday you’ll be glad that you did, because the planets from Thursday will lighten your mood considerably! Tuesday’s full moon may home in on contacts! Today's Wisdom from around the World:Let every fox take care of his own tail. I'm glad that this should be a better week. I woke up this morning at 5:30, logged on and went back to bed. I'm tired. It's been a long week, already. Yesterday was a very draining day for me emotioanlly and I needed to get some energy back. Speaking of energy, did you see Oprah yesterday? They had a lady on that said she unplugs everything from the wall when she isn't using it and saves a ton of money. She says she save hundreds of dollars doing that. I wonder if it works? 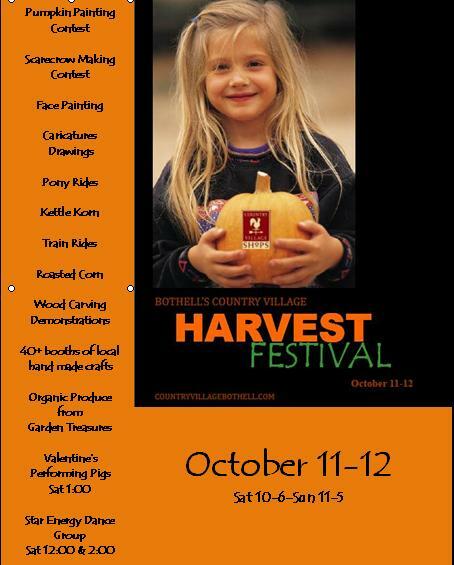 The Harvest Festival is this weekend at Country Village. Here's a liitle peek at what's going on….. I didn't blog yesterday so I could take time to email all our good customers and friends and ask them to vote for us in the King 5 Best of Western Washington contest. We jumped to first place for awhile yesterday morning which was awesome, the went back to second…. which is great too. To get nominated at all has been amazing and I'm really happy that someone thought enough of our little shop and hair salon to nominate us and even more, for us to make it to first, for even a little while. I should have waited to do our mailing until this morning though. I've become accustomed to checking the standings a few (ok several) times a day. I couldn't help myself, it was fun to see where we were. But oh my gosh, they won't let you see now! Now you get this message: We have turned off the voting results. Voting continues through October 13th. Please check back October 27th when we start to announce the winners of the 2008 Evening Magazine's Best of Western Washington. What? What?! Urghh, no way. Really? We were neck and neck for the first place spot and now there is no way of telling where we are, not until who knows when. Oh well, it was fun to see us in first place but for a few hours, I wish I would have printed that screen. I hope we win, but you know, it's good to just get nominated….and so late in the game. Really. The one thing I have enjoyed hands down are the great comments (45 as of right now!). I work hard, I'm in the store 6-7 days a week, up at 5:30 in the morning getting work done at home. We have so many positive comments and to me that says it all, it makes it all worth it. It isn't an easy process, you have to register and go back and check your email and then go back and vote… .and leave a comment. It takes a little while to go through the whole thing and people are busy. Because it takes so much time I thought about offering a discount or something for voting, but it didn't feel right to do that and I wanted my votes fair and square not because I gave something in return. You know what I mean? So if we place in the top three, I hope we do, then I think we should have a party for everyone. That's what we'll do! A night (or day) of food and celebration. Cookies, juice and fun stuff for all the kids. Maybe a glass of wine for the moms and dads. That's what we'll do anyway. I've won already. It's 5:30 in the morning and I'm thinking about documentaries. I think it's because I fell asleep last night to Fox News and they were doing a one hour special called something like …. The State of the Economy and How we got Here. I found several things in the story interesting. I just wish it wasn't on at 10:00 on a Sunday night as I was about ready to fall asleep and didn't pay total attention. I'm in a desperate attempt this morning to find the story on their website to re-watch it. While looking around I found this news story from yesterday on tainted chocolate. I am on a quest to find it and put a link up on this blog. Only because it seems important. Maybe I'm gullible and maybe it's slanted but as an average American parent, small business owner and citizen trying to get by in these times I'm interested in any information I can get to try and figure out what happened and the plan for the future. On another totally random note….. Check this movie out on dvd if you get a chance. Wal-Mart The High Cost of Low Pricewas one of my favorite documentaries (Ebert & Roeper gave it two thumbs up). I saw it over a year ago and I have never set foot in a Wal-Mart since. I used to go to the one in Lynnwood to purchase all my cleaning supplies, diapers and little ding-dong things never leaving without spending over $100.00 on "stuff", because there is so much "stuff". I would always get more than I needed because there were so many cheap things to choose from, that all added up when I got to the register. I was horrified after I saw this movie. I know my one sale a month doesn't do anything to change their business but out of good conscience I just can't go in there and spend any of my hard earned money. It is a must see, seriously. I think what I find interesting about all these things is they all go back to regulations. It seems when things aren't regulated they spiral out of control and it makes me really curious as to who benefits from it. I'm not by nature a very political person, but I think I need to start paying attention. Not that I can really make a difference, but sheesh I think I should understand it and I'm embarassed to say, I really don't. Yesterday was a bad day. The rain kicked in, the sun is gone. It was surprisingly slow at County Village, everyone seemed to have stayed in. I'm sure it has to do with everything going on… the election, the economy…. all that fun stuff AND it was cold and damp. It gave me time to work on that Best of Western Washington thing a little bit. Now that the website migrated I've been trying to figure out how to get my old email addresses back from the mailing list. The old site had a newsletter feature, the new one doesn't. But it gives you the option of using Constant Contact. Does anyone know if that is a good source? Anyway, I want to send out a little mailing becuase I want to let our customers know we are nominated and to vote! I am so not a competitive person, in fact, I saw that this was going on and thought it would be nice to be on there but just figured we were just a little shop in the little village that some people know about and like. Which is perfect all by itself. But now that we have been nominated, I'm really excited. Do we have a chance to win? I doubt it. Do want to? You bet. We are in second place though, which is amazing after two days but about 20% of the votes separate us from 1st place. I don't know what happens if you actually win. I think (maybe) Evening Magazine comes out and does a little thing on the winner. I would love for people to know what is in Country Village. Do you know how often I hear… I didn't know anything was back here? Anyway, I worked on all that and my parents show up to drop the girls off to me at the store because Bella has her first Brownie meeting at 6:30 and I wouldn't have time to pick them up in Kirkland. I get them immediately moved over to my car and after thanking my parents put the car in reverse and nothing. The car doesn't move. It goes forward, not backward. My dad says the transmission is gone and I might as well drive it home since it goes forward, he'll back it out for me. He gets in, steps on the gas and I just hear a crunching noise come from the engine area. I scream, he stops… that's it. I refuse to drive it forward, fearing that I will cause further damage. No Brownies, no car. More on my plate. Strike out #3 from my September 8th post.